Oxford. 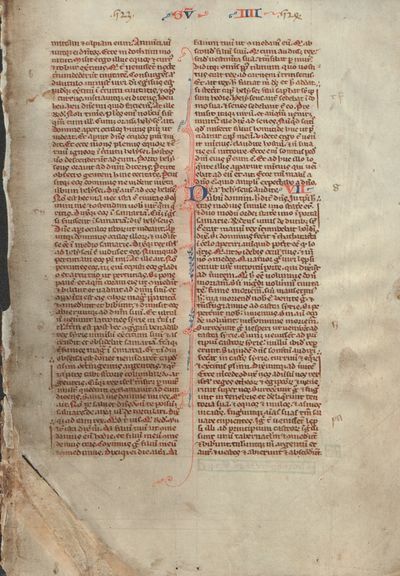 Leaf from a Medieval Bible with illuminations, rubricated chapters numbers, initials and marginalia in red and blue ink. Dated circa 1240 and in very good condition. Leaf is vellum with Latin gothic script in brown ink with text on both sides, and measures 5 ¼" X 7 ¼". There are 51 lines of text in two columns in minuscule script, amounting to 10 lines per inch. Leaf is in very good condition: there is a 2 ½" tear on bottom corner that has been repaired with archival tape, not affecting content; leaf, including all edges, has moderate soiling; vellum is fragile; ink is dark and still quite bold. This bible leaf was produced in the workshop of English illuminator, William de Brailles. He was the illuminator for the Oxford Bible and his Oxford workshop was active between 1238 and 1252. This leaf is from the Book of Kings IV, Chapters 6 -8. ; 12mo 7" - 7½" tall; 1 pages .